This is a blog that has been waiting 57 years to be written. It is the story of the lifelong dream of an 11-year-old boy. Long ago, I decided that if I was going to live on a boat, then it had to be all the year round – otherwise it would just feel like a holiday. Admittedly, I still have family commitments so I shall be going home this week for ten days – and then again over Christmas and New Year. But the house in Woodbridge is beginning to feel like a place to visit whereas life aboard Samsara is rapidly becoming “home”. And today I have had my first taste of what that means. It was, in a sense, a test: The forecast was 25kt winds, a real winter chill of 30C and driving sleet. In fact, when I awoke at 0830 with the boat heeling to 30kt gusts whipping across Kirby Creek, the thermometer above the chart table registered 70C. This seemed encouraging – until I considered that it probably had something to do with the fug released by unzipping two sleeping bags, one inside the other. But who needs to get up at 8.30 on a day like today? I climbed back in, taking with me the Kindle and Neil Hawkesford’s A Foolish Voyage. So, I emerged for a second time at 10.30 – and found the cabin still wasn’t any warmer. For a moment I hankered after one of those automatic forced-air central heating systems where you poke one finger out from under the duvet, push a button and wait for the boat to reach a sensible temperature. 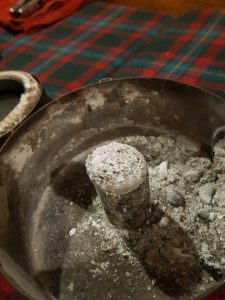 Of course, I could have roused myself to get up and light the charcoal stove but that seemed like a slippery slope – pretty soon I would have it running it all day as well as all evening and, while matters might yet come to that, I don’t want to start down the wimpy route until I have to. It got me as far as a late lunch and a second cup of tea but after sitting still for an hour finishing the book, 70C didn’t seem so homely any more. I lit the stove at 3.30. By 9.30 I was sitting so close to it that I was beginning to singe. By 10.30 I was a back in the two sleeping bags – now with Hawkesford’s second book A Foolish Odyssey. In the rigging, the foul weather gear drips beige water onto the deck. The dinghy floats obediently astern, looking as though it’s just come out of its box – and in the cockpit locker, the kedge anchor sits snug in its stowage with the chain and warp flaked into the canvas bag awaiting the next emergency. I hope it’s a long time coming. I’ve had enough of the kedge for a while. All this started with the non-existent oyster bed and the big orange mooring buoy which you may have read about the other day (www.oldmansailing.com/captain-calamity). At the end of that slice of embarrassment, we left the kedge on the bottom with a fender marking the spot. Ever since then, I have been trying to recover it. Since it was quite clear that pulling it up from the dinghy was never going to work, Plan B was to use Samsara’s famously buoyant bow to exert the pull. All I had to do was get it over the anchor, keep the stern straight with a line to a buoy and reverse off, pulling the wretched thing with us. There was only one flaw to this plan. The anchor – which I set with the idea that it was somehow going to pull me off into deep water, was not in deep water at all. Maybe I’m being naïve but since it wasn’t far from a mooring buoy, I sort of imagined that this would indicate a reasonable depth. Instead, the recovery attempt stopped a good 20metres short as the keel met the bottom all over again. Never mind, Plan C was to tie the warp to the spinnaker halyard to increase the angle and trick the anchor into thinking the pull was coming from above. This idea was brilliant: The boat dipping forward and anchor popping out with the sort of sound eight-year-old boys make with their fingers in their cheeks. Not so. That will only work if the pull is exactly over the bow. A couple of degrees off and the boat just heels… and, of course, gets dragged further over the shallows. By the time we were at 300 and things in the cabin were falling over, this seemed like a very bad idea. I was not looking forward to Plan D. It came under the heading of “Last Resorts” and involved going out there to dig for the anchor. I knew, with great foreboding, this was going to be messy. Well, she carries one of those little scoops that used to tuck into the back of Edwardian coal scuttles. I use it for doling out charcoal for the stove. So, fully equipped at nine O’clock in the morning, an hour before low water, I plunged into the mud. There was. I remember seeing it years ago on those huge mud flats in the Bristol Channel: Mud horses – the sledge-like contraptions fishermen use to get out to their nets. The horse supports the man’s weight while he pushes with his feet. The dinghy could be my mud horse. It was brilliant, I scooted up the slope in no time at all. I found the fender, found the chain. Taking the trusty shovel, I began to dig. You remember I said the shovel came from a coal scuttle? That I used it for charcoal? What I should have packed was a garden spade. With the first scoop of mud, the shovel bent at right angles. There was nothing for it. I would have to dig with my bare hands – or, rather, with Messrs Gill’s very expensive Leather&Gore-Tex Helmsman’s Gloves. But, what did it matter? By that time, the even-more-expensive Henri Lloyd offshore suit was the colour of cappuccino. I found the Fortress about 30cms down, clearly headed for Australia. Down there, the mud was a serious blue-grey colour and the consistency of potter’s clay. There was no other way this was coming up without the shank going vertical. It was one hell of an advert for an anchor. 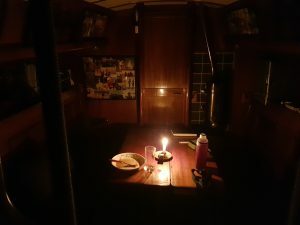 It took me another three hours to get cleaned up – a matter of endless buckets of water and going round the dinghy, the topsides, the deck, the cockpit and, of course myself again and again until everything ran clear. Well, this being the East Coast which is four parts mud to six parts water, beige is the best you can hope for. Captain Calamity appeared every August, regular as clockwork. He would be an old man sailing a wreck of an old boat that he’d picked up for a song and he would be navigating by road map – usually an out-of-date AA handbook. And, of course, the lifeboat would go and fetch him. It is one of the great benefits of sailing in UK waters that the lifeboats are manned by volunteers, funded by charity and free at the point of use. Because, having been towed safely into harbour, Captain Calamity would have a shower in the quayside facilities, a good meal ashore and then set off again – only to get into difficulties once more and be towed in by the next lifeboat down the coast. At about this point, the lifeboat coxswain would advise the old boy that his vessel was really not seaworthy or he needed some navigation classes or perhaps the whole expedition was a terrible mistake. It would be at about this point that the newspapers would become involved – and sure enough, at the Daily Mail, I was the recognised “Captain Calamity Correspondent”. I would hasten to Hull or Skegness or wherever and record the next stage of the unfolding disaster because, you see, nobody could stop Captain Calamity. In the UK you don’t need permission to go to sea. You don’t have to have passed exams or carry any safety equipment. 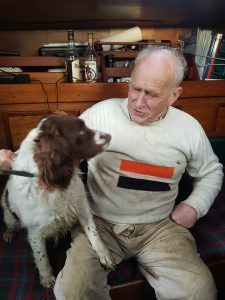 If you can put up with the shaking heads on the quay and doleful predictions of the local fishermen, you can go – whatever the Lifeboat coxswain may say. Ever since, I have been acutely sensitive to the prospect getting myself smothered in ridicule – like for instance going aground on at the top of the highest tide for the next ten days. Which is what happened today. 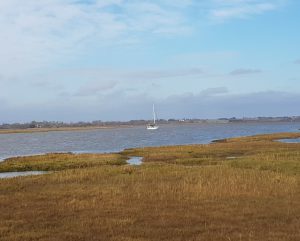 If you have been keeping up, you will know about the abortive expedition to fetch water from the pub at Kirby-Le-Soken, trespassing for a pee on Horsey Island and the “Beware Oyster Beds” sign which had blow away. Anyway, yesterday I went round to the marina on the pretext of replacing an empty gas cylinder and filled the water tanks while I was at it. And while I was at, my fisherman friend, David with his permanently damp dog, phoned to ask whether I could possibly help him investigate a leak in his heat exchanger. It was awkwardly right underneath the engine and he thought I was more nimble than he was. It was arranged that I would go back to Kirby Creek today – which, of course, is where I must take the big orange mooring buoy and not anchor in the middle of the oyster bed (even though David, who has lived here all his life, says there haven’t been any oysters in the creek for years and they only say that because they don’t want any more moorings). I could see the orange buoy as I felt my way down the channel between Horsey Island and Skipper’s Island, the Navionics app on my phone pointing the way. I have great faith in Navionics. The other day, I trusted Google Maps to find me the way to Kirby Quay and it got me just as lost as Captain Calamity with his AA map. And that was where we came sliding gently to a halt. First, I put the engine in reverse and wound her up to full throttle. No joy. Then I started hanging off the shrouds, hoping to heel the boat to reduce the draft. Next, I waited a bit in the hope that the tide might rise further. After 15 minutes, it was clear that desperate measures are called for. If you don’t take desperate measures when you have the chance, you’ll wish you had when it’s too late. I broke out the kedge anchor, inflated the dinghy, added 50metres of warp to the 20 on it already and rowed the lot across to the other side of the creek. Then, with the engine flat out astern and the warp on the sheet winch, I stirred up a lot of muddy water – and went precisely nowhere. The tide was still flooding but Samsara seemed to be welded to the bottom. The only saving grace was that the creek was utterly deserted. My ignominy was as yet, a secret. Of course, it wouldn’t be a secret if I was here for ten days. They would put up grandstands and sell tickets as the boat dried out downhill and filled with mud and water as the tide rose and she stayed on the bottom…. From time to time I switched off the engine and waited. Eventually, I transferred the anchor warp from the stern to the bow and got it on the electric anchor windlass. There was a moment of euphoria when the boat began to turn. But would so go forward? No, she would not. Not by so much as a blade of grass in the transit across the saltings. I began to think of calling for help. But what did I expect? Already I had a warp that was bar-taut. No launch was going to be able to do better than that. By this time, high tide was ten minutes away and I was beginning to consider what would happen if I just left her there for the winter (at this stage I hadn’t checked the almanac and somehow had it fixed in my head that this was the highest tide until the spring equinox). Agonisingly slowly, we began to wriggle through the mud. You could almost hear sucking noises as the creek bed released its grip on the keel. Quickly, before anything else could go wrong, I recovered the 50m warp and tied a fender to the remaining 20metres. I can go back for it tomorrow. We were free. Indeed, I am writing this anchored defiantly in six metres in the middle of the non-existent oyster bed and thinking that there was, in fact, one other weapon in my armoury: I could have attached the spinnaker halyard to the anchor warp and heeled the boat to 30 degrees, dragging her off that way. Would the higher angle have pulled the anchor out of the mud? Not with that length of warp, surely. Maybe that will be one for next time. If there is a next time. Recently, I posted the fabulous news that this little blog had received 500 views so far this month – and we were only a third of the way through it! Then, there was a comment saying that “this appears to be a clever network marketing scheme to sell a dietary supplement”. That stopped me in my tracks. Maybe I have some explaining to do. After all, the site does feature a page called “Good Health” which, indeed, promotes a dietary supplement from a Network Marketing company. Anyway, I must hold up my hands: Yes, I am a Network Marketer. I started in 2005 for the very good reason that I was 55 years old and nobody would give me a job. That business was in the utility sector. It paid for the boat and now supports my family ashore. By contrast, the dietary supplement business is very small indeed. Last month I earned £61.05 – hardly enough to justify buying a sailing yacht as a promotional tool! No, the reason I promote the health product is because I am very anxious that the company which makes it should survive in what is a very over-crowded market. Their product is unique and if they go under, I won’t be able to get it anywhere else – and I firmly believe that I would not be able to continue like this without it. I still carry with me a vivid picture of my life back in 2015 when I was so ill that I ended up in hospital because I had banged my elbow. Had I continued on that path, what condition would I be in now at the age of 69? A lot of people of 69 can’t walk a mile. Yet during our family weekend in the Peak District in September, I walked 12 miles on the Saturday and another eight on the Sunday. It’s not a marathon but it’s what any normally healthy person should be able to do. I have not seen a doctor since 2016 and do not carry any pharmaceutical products on my boat at all – not even an aspirin. Also, you will notice that the supplement is not “in your face”. There is no flashing advertisement on the front page – just a reference here and there in the text and a page given no more prominence than the other eleven. I have realised that it is better not to be strident about it: In the Azores, I met a man enjoying his retirement living aboard a Contest 48. His only complaint was having to fly back to the UK every three months to see his doctor. I began to tell him my story – but I can still see the distain on his face as it dawned on him that I was trying to sell some sort of snake oil. So, the blog will continue to focus on the adventures (another attempt to reach Kirby-Le-Soken coming up.) Only a tiny percentage of readers will be interested in the “Good Health” page. But I like think that if the sceptics continue to follow me as I grow older and older, cheerfully defying the ageing process as I go, then maybe they may look again at my “clever scheme”. Everywhere I look, I see land. Rather muddy land, admittedly. But here, half a mile further up Kirby Creek, surrounded by saltings and winding water, with only the birds and the seals for company, I am as protected as I can be. Last night we had a bit of wind and it barely raised a wave big enough to slap against the hull. We did heel over as a gust caught the mast and revved up the wind generator. The coffee pot fell off the cooker but otherwise, Samsara stayed as rock-steady as if she had been chocked up in a boatyard. This was all because of The Expedition: It’s now a week since I arrived here and the water tanks ran dry on Thursday night. I have another 30 litres in cans and a couple of emergency bottles but what with that and running out of apples, the time had come to go and find civilization. Round here, the village of Kirby-Le-Soken fits that bill. It has a pub and a shop and – presumably, a water tap. All I had to do was take the dinghy up to the head of the creek where, apparently, there is a quay accessible at high tide. That was going to be at 1234 yesterday and so I set off at about 1100, properly dressed in wet-weather gear with all the gash and the empty water cans and Google Maps on my phone to stop me following the wrong branch of the creek. For some inexplicable reason, the outboard engine wouldn’t start. Odd, that. Now that it has a new fuel tap, it’s been very reliable… maybe all it needs is a moment to cool down – 2-stokes are funny like that. I started rowing. An hour later, after several stops to try the engine again during which I drifted backwards into the mud and the seal, with its head out of the water like a Labrador with no ears, watched silently as if wondering what on earth I was doing. Actually, what I was doing was checking Google Maps and realising that after an hour of hard rowing, I was still only half way – which meant that at this rate, by the time I got there, walked up to the village and back carrying 30kg of water and with the shopping on my back, the tide would be falling fast. What if I ran aground on a falling tide – marooned for eight hours in a dinghy surrounded by thigh-deep mud? Casting around for a solution, I spied a jetty – well, a haphazard collection of old timbers sticking out of the mud with a few rotting planks on top. It would have to do. Somewhat gingerly, I stepped ashore and walked up the staging to what passed on Horsey Island for solid ground. I know all about Horsey Island. It is privately owned and a bird sanctuary – no landing allowed. In fact, Tamsin and I came here in 1995 and interviewed the owner, Joe Backhouse, when we were writing about our adventures for the Daily Telegraph’s travel pages. This might very well have been the spot where Blue the dog disgraced himself by catching a Brent goose (I don’t know who was more surprised). The place didn’t seem to have changed. It was just as desolate as I remembered – in fact, having dealt with the urgent matter at hand, I took out my phone and recorded a quick 360 for Instagram (you can see it on john.passsmore.756). That was when I noticed I wasn’t alone. An equally old man with a white beard and a woolly hat arrived with two plastic bags. I’m afraid, I can’t remember what he said in reply (would you?). But he did ask me if that was my boat anchored further down the creek. “There’s a sign,” he said. So that’s where we are – in a deep hole surrounded by shallow water (we’ll never get out except at high tide) – and the shallow water surrounded in turn by soggy but protective land. All I need now is for the outboard to work tomorrow. I just rang my friend David the fisherman who helped me catch a herring and a brace of whiting. He tells me I’ll get water at the pub. If I ever get there, I think I might deserve more than water. ….absorbs the meths and keeps the flame in the right place. It’s taken long enough but finally, I think I’ve cracked the business of lighting my Hampshire Heater. The company does send out instructions with every new heater but these are fairly basic and I have to admit, I struggled. Rake through the cold remains of last night’s fuel with a long-handled screwdriver to knock the ash into the ash-tray. Remove the ash tray. Save a dessert-spoonful of ash and dispose of the rest. While doing this, have something like a baking tray underneath to catch any stray pieces of fuel or ash. Before replacing the ash-tray, put a small amount of lumpwood charcoal into the cylinder – no more than 30mm deep. The reason for this is to allow plenty of air to flow up through the fuel – so don’t use the end of a bag of charcoal for this because it will block up the gaps with coal dust. Do this without the ash-tray attached. You do not want unburned fuel to drop into the tray because it will ignite from the hot ash falling on it. This will set off your Carbon Monoxide alarm as the gas escapes through the vent rather than up the chimney. Some small pieces of fuel will drop through into the baking tray. Add them back to the top. Carefully pour the dessert-spoonful of ash onto the top of the wick. Equally carefully, pour a capful of methylated spirit onto the ash on the top of the wick. 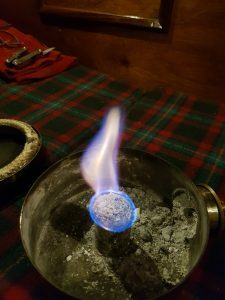 The reason for doing this is because I found that the wick itself does not absorb all the meths and the excess runs down into the tray which can cause a disconcerting blaze – and even blow out the wick. The ash on the top of the wick absorbs all the meths and keeps the flame where it should be. (The manufacturer now recommends barbecue lighting gel instead of meths – it stays put). Replace the top of the heater. Open the vent and light the top of the wick. Replace the ash-tray. Do not add more fuel until the heater is well alight. Adjust the vent – a quarter turn is enough to keep it burning. From this point on, you may continue to add more fuel as you please. Well, not really, of course: The engine battery is still raring to go at 12.8volts but I can’t touch that – who knows when I may need to start the engine in an emergency? Meanwhile, the service battery – the lights, the phone charger, the rechargeable DAB radio, the laptop on which I am writing this – that’s where the amps drain away. If I was going somewhere, this wouldn’t happen. I would have the water-turbine trailing out behind, pumping in the amps (you can see it in action on the video on the “Good Health” page). But that’s no good without water flowing past the boat at more than three knots and all we get in Kirby Creek is half a knot of tide at the height of the ebb. I do have the solar panel which I left tilted backwards on the assumption that the stern would be pointing south-east when the sun came up. Sure enough, when I looked before breakfast, we were getting a steady 2amps but I’m afraid I was profligate with my current and spent the morning charging the radio and writing up yesterday’s fishing expedition (you can’t see it yet because I’m going to show it to my neighbour and fishing companion – I never did that when I worked for a newspaper). Anyway, the BBC forecast was for a “moderate” wind in the afternoon and I hoisted the generator into the rigging with a propeller in place of the water turbine. The trouble is that it needs 15 knots before it starts turning at all and by the time it was too dark to see, the battery was on its last legs at 11.5volts – and still draining 1.1amps. I went round turning off lights, unplugged the phone… still negative figures. Where was it going? Of course: The masthead light comes on at dusk and helps itself to 0.2amps. Well, I knew what to do about that. Out came the trusty hurricane lamp. I had one of these on my first boat – and well I remember my father’s ritual with the anchor light at dusk. It is rather academic in Kirby Creek – the last of the lit buoys is down Hamford Water at the junction with the Walton Channel, the best part of a mile away. Who’s going to come up here on a pitch-black night like this in half a gale? Hang on, who said there was half a gale blowing? Last time I looked there wasn’t enough to squeeze out a tenth of an amp. Suddenly, now the battery is sucking up 1.1. I poke my head out of the hatch. The boat is heeling under bare pole. The anchor light has blown out, but who cares. I reckon there’s even enough to fire up the phone and ping this off to WordPress. I’m not alone after all. 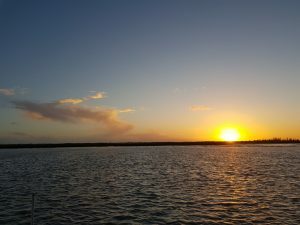 Anchoring last night in Kirby Creek in the Walton Backwaters, the only other vessel was a tiny fishing boat on a mooring – unoccupied … and still I left 300 yards between us. Then, today, an old man (another one) rowed acoss in an ancient weed-covered dinghy to say hello. He’d been taking his dog ashore – a liver-and-white springer spaniel and I’ve got one of those at home so we had something to talk about. After a couple of minutes about where he could land around here without sinking thigh-deep into the mud and how he had left his friend Paul on the boat wrestling with the wiring, a small voice in the back of my head suggested it would be neighbourly to invite him aboard for a cup of tea. Immediately, of course, another voice burst in, protested at the invasion of my solitude – and adding the age-old warning about inviting single-handers for tea (you can never get rid of them). But I know that if I keep spurning all human contact, I shall end up even more reclusive and socially awkward than I am already. So, yes, he replied, he would delighted to come aboard for a cup of tea. Getting him onto Samsara was a challenge that neither of us had considered. David Haig-Thomas is 78 and you only have to look at his oil-stained sweater and his prehistoric corduroys with their missing buttons to know that he is not the sort of man to baulk at climbing aboard without benefit of a ladder. Actually, next time I shall get the ladder out. I am still trying to remove my heart from my mouth at the memory of him swaying between dinghy and deck, his entire weight on the wobbling wire guard-rail like a clown on a tightrope. Actually, maybe they weren’t such tall tales. I just looked up the arctic explorer David Haig-Thomas Senior and yes, Haig–Thomas Island is one of the Sverdrup Islands in the Qikiqtaaluk Region in Nunavut, Canada’s northernmost province. During the war he volunteered for the commandoes and died in the D-Day landings when young David was four. After our tea, my guest swayed, mightily, once more and eventually settled with Susie the Springer in the ancient dinghy and set off again – whereupon Susie promptly jumped over the side and started swimming. Neither of us were sure about this, given the distance she would have to cover – even with the tide. In the end David headed for a pebble beach which looked marginally less muddy than the rest of the foreshore. As dusk fell, I could hear an engine running and could see a blaze of fluorescent light from the little fishing boat’s wheelhouse. The wiring seems to be connected again. Just as well. Apparently, we’re going herring fishing tomorrow. “A Rival is she?” The harbourmaster stood and looked as Samsara, dried out against the scrubbing posts at Felixstowe Ferry and proudly showing off a clean bottom. (If you have been following this blog, you may have seen the picture of “The Infestation” of goose barnacles which appeared out of nowhere). I had just scraped off the last one and was going round the topsides with a rag and a bottle of hull cleaner, so I was feeling a certain pride of ownership already – but there’s nothing like a compliment from a harbourmaster to put things in perspective. Harbourmasters have seen it all and you could tell that this one had seen it all and shaken his head over most of it. I had waved to him on the river as he chugged past in his ancient workboat with “Harbour Master” flying from the ensign staff. This was the vessel, I learned later from the sign on his ancient office, that was available for sightseeing trips – and ash scattering by arrangement. Well, yes, I suppose so. Nobody has ever claimed the Rival is a fast boat and – it may be a product of my return to the design in retirement, but I don’t mind that any more. Thirty years ago, when I took Largo across the Atlantic in the OSTAR, I had ironic T-shirts printed with the legend: “Largo: Broad and Slow” (I looked up the musical term in a dictionary). Now I realise that if you have a fast boat, all you want is a faster boat. You’re constantly up-grading the gear – not because there’s anything wrong with it, but because the man on the stand at the Boat Show says it’ll give you an extra half a knot. So, I have been able to forget the harbourmaster’s father’s views and concentrate on Samsara’s other virtues – of which, we agreed, there are many. …not forgetting, the extra half a knot that comers from not towing a bottomful of barnacles.